Kitman TV: Micheal Coren vs. Rabbi Boteach - "How Jewish is Hollywood?" featured, Michael Coren » Micheal Coren vs. Rabbi Boteach - "How Jewish is Hollywood?" 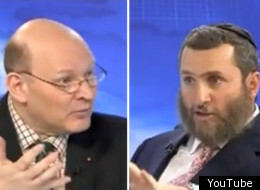 Micheal Coren vs. Rabbi Boteach - "How Jewish is Hollywood?" Apparently Schmuley still lives in a world where this is supposed to be some sort of deep secret..
Luckily Joel Stein set that record straight a few years ago, in his famous L.A. Times article How Jewish is hollywood ?